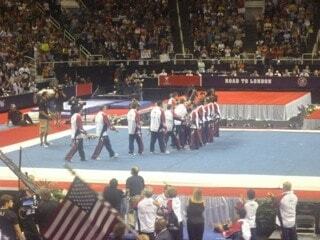 We arrived in San Jose, California the evening of the Women’s Gymnastics Competition. Once we landed we took a taxi to the hotel, checked in, and immediately headed out to catch the end of the Day 1 competition. Jasmine impressed me with her knowledge of the girls competing; she could tell me many of the girls’ ages and even their heights. Hotel de Anza was conveniently located just a few blocks away from the HP Pavilion where the event was being held. We were able to soak in some of the scenery on our brisk walk to the Pavilion, and over the next two days had some down time to explore the city a little bit more. When I was a kid, I watched Women’s Gymnastics on television with my parents. Nothing prepared me for what it was like watching it in person. We had incredible seats located by the beam; we could see the girls’ muscles shifting back and forth as they turned, twirled, and dismounted from the beam. If we wanted a closer look at any of the other events, we could watch on the big screen at the top of the ceiling. It was especially helpful for the vault, floor, and bar events. We missed most of the events from this day, but I got enough of a taste to know what to expect over the next two days. The energy for Men’s Gymnastics is really different than for the women’s. The first difference that we noticed was how the competitors were introduced to the crowd. There was smoke and loud music, and when the women were introduced the following day, it was much more subdued. We had the same seats throughout each day that we attended the trials. 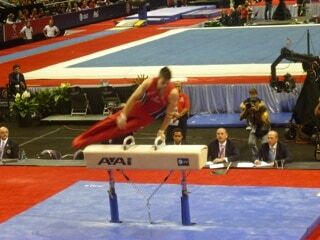 For the Men’s Competition this day, we had perfect seats for the rings and for the pommel horse. This was the first time Jasmine and I would get to see everything from start to finish. I quickly became familiar with the men competing, keeping a close eye on Chris Brooks and John Orozco. Chris Brooks caught my eye not only because of his good looks, but because of how he interacted with the crowd and his fellow teammates. Chris would often shout at one team member in particular during his routines, which caught my attention because it seemed like it would be more distracting than helpful. From then on, Chris was a competitor that I could not stop watching. He fed off the energy from the crowd, and did his absolute best for each routine. John Orozco was one that all of us in my section were watching because of his serious expression. We could tell that this night meant everything to him, but his phenomenal scores gave him nothing to worry about with getting placed on the team. I kept wanting to see him smile or show even a little bit of what he was feeling, but he displayed an intense expression throughout all of the rotations. This day out of the three was the most intense and heartbreaking to watch. Not only did a lot of dreams come true for those amazing women, but for many this seemed like the end. For those women who had trouble during their performance, it was very emotional for the audience as well. Most notably, I got misty-eyed for both Rebecca Bross and Nastia Luikin. Rebecca Bross had some difficulties on the uneven bars, falling flat on her back as she tried to grasp the high bar. The audience was very supportive, cheering her on and encouraging her to keep going. When she fell face first on the mat, both the spectators and Nastia herself knew that she wouldn’t be making the Olympic team. From where I sat, we could hear the thud, and from the expression on her face, I knew pain was coursing throughout her body. Thousands of people throughout the HP Pavilion rose to their feet and gave her a standing ovation–twice. She picked herself up, walked to the chalk bowl, and got herself prepared to give it a second shot. Later this evening, the Men’s and Women’s Olympics teams were presented to us. It was finally in this moment that John Orozco smiled, and when he started wiping tears from his eyes, I brushed away my own tears. These men and women that will go to London later this year to represent the United States have given so much of their lives to this sport, and their dedication and passion for it is so incredible. The sacrifices that they have made to get where they are today are not ones that can be made lightly. And there is also the chance that an injury could ruin all chances at a medal. For some, this was the end. For others, the beginning of a beautiful end. I love gymnastics and cannot wait to watch the competition at the Olympics! I can only imagine how emotionally charging it was for the audience & competitors alike! I’ve sat on the edge of my couch at home just watching it on t.v.! !